At some point in a wealthy investor’s life, he or she transforms from someone concerned with how to increase their wealth to someone concerned with what will happen to that wealth when they pass away. Wealthy investors who have children and grandchildren spend a great deal of time worrying about those generations of the family. They worry about their health and their education and they really worry about how the investor’s great wealth affects the progeny today and in the future. That concern extends to when the investor dies. The greater the wealth, the greater the concern about what will happen to the wealth when the eventual happens. Spectrem’s new study on the most affluent of investors, The Wealthiest Americans, examines the concerns of investors with a net worth of $25 million or more. The research enquires about the investors’ mindset when it comes to the past, the present and the future of their wealth. The point of the research and the value it has for advisors is that investors want to prepare their children and grandchildren for what they are eventually going to receive. They want advisors to help in preparing these offspring for the difficulties that come with great wealth. Is this concern pervasive through all wealthy investors? No. But it does hold sway over more than half. While 55 percent of the wealthiest investors attribute their happiness in part to their significant wealth, 56 percent worry that the next generation will waste the wealth in some foolish financial behavior. This is where an educational program for offspring can be of assistance; an educated investor is less likely to be a foolish one. The concern about the next generation was unusually high among investors who are 50 years old or younger (70 percent). Worrying about wasteful progeny is one concern, and calls upon both the investor and the advisor to teach the younger generation how to handle great wealth. But a whopping 83 percent of the wealthiest investors worry that their wealth might be detrimental to the work ethic and educational and occupational pursuits of the children and grandchildren. After all, why work or study hard when you already have it made? Statistically, the concern over the possible detriment of great wealth upon their children and grandchildren is much higher than their concern over their current financial position (83-62). That concern mentioned above can turn into a boon for the primary advisor working with the investor, and the study explains how. Almost 70 percent of the wealthiest investors say they have or will encourage their children and grandchildren to use the same financial advisor they used. 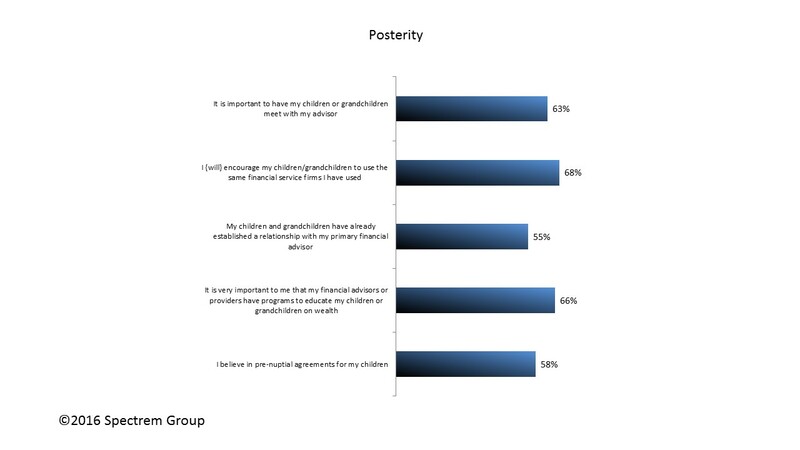 In fact, 55 percent of the investors have already seen their offspring establish a relationship with their own primary advisor. For the investor, the concern is about keeping the money in the family. For the advisor, it is about keeping the family in the company. A detailed educational program for the next generation can certainly help make that happen. The role financial advisors play in the transfer of wealth is often not a primary one. Affluent investors are more likely to discuss the wealth transfer with attorneys than they are with their financial advisor. The role the advisor can play is not as a facilitator of the transfer itself but as someone who can prepare the children and grandchildren for what is coming in terms of wealth, and begin conversations with them about what they are someday going to inherit.